Parks Commissioner Veronica M. White (in pink scarf) at the dedication ceremony. 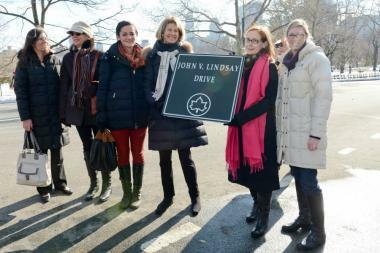 MANHATTAN — Pedestrians and cyclists who enjoy using Central Park Drive without having to battle traffic have former Mayor John Lindsay to thank — so the city returned the favor Monday by naming the stretch after him. "Mayor John V. Lindsay worked to promote our parks as centers where New Yorkers could enjoy biking, walking, and running all year round," Parks Commissioner Veronica M. White said in a statement. "His efforts in Central Park were a big step towards this goal, making the renaming of the Lower Loop a fitting tribute to his legacy." Lindsay first closed the drive on weekends in the summer of 1966. The idea was so popular with the public that the city implemented the closings year-round in 1967. Other parks, including Prospect Park and Forest Park, soon followed suit. The dedication ceremony Monday took place at Central Park Drive and West 67th Street, not far from Lindsay’s old Upper West Side home. Former Lindsay officials Jay Kriegel and Sid Davidoff were on hand for the event, recalling the the controversy that originally surrounded the plan. Lindsay's other transportation innovations included closing Fifth Avenue to traffic on Sundays in 1970, as well as an unsuccessful 1973 proposal for a Madison Avenue Mall that would have closed the avenue to car traffic from 34th to 57th streets. Lindsay's daughters, Kathy Lake and Margi Picotte, shared their memories of spending time in the park with their father at the event. "We remember as young children, living in Gracie Mansion, that the six of us would ride our bikes together through Central Park with so many other families on bikes, or just strolling, and joggers, who would call out their thanks to our dad for closing the park to cars,” they said in a statement.